Hong Kong is considered as one of the safest and busiest international ports where construction and maintenance of large-scale marine infrastructures for port development never stop. To align with the rapid development, land surveyors from private practice and the civil service actively participate in charting for the up-to-date seabed terrain over Hong Kong waters for navigation, construction or maintenance of marine facilities such as fairways, piers, container terminals and mooring buoys, reclamation for the provision of land and public filling area for construction and demolition waste. 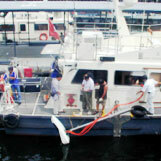 Port development projects rely on accurate knowledge of bathymetry, thus, hydrographic surveying techniques such as sounding survey are inevitably required. With the continuous advancement of technology, the efficiency, effectiveness and precision of hydrographic surveying systems are improving without a break. 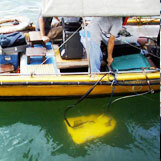 Single beam or multi-beam echo sounding system positioned and navigated by Differential Global Positioning System (DGPS) - free correction message broadcasted by Marine Department of the HKSAR Government - becomes a standard for bathymetric survey instead of the traditional sextant and wire.